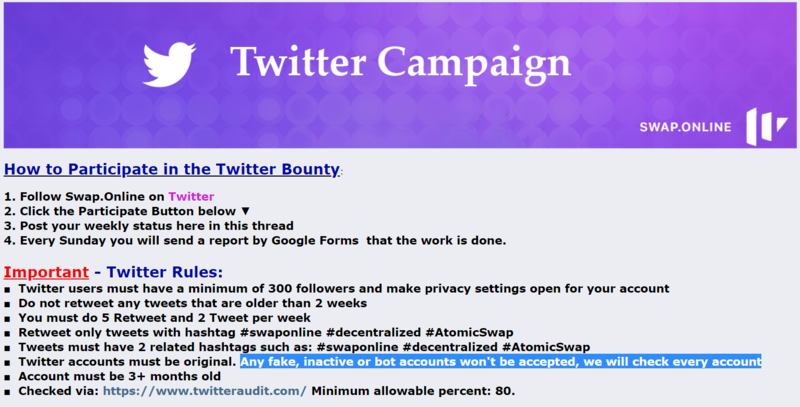 According to Bounty rules and conditions “Any fake, inactive or bot accounts won’t be accepted”. We did research of Bounty hunters and found out the fact, that all participants of the second week of Bounty campaign were doing their task using Twitter accounts, which are created only for Bounty. The point is that there is no useful or real info except tweets and retweets about other Bounty campaigns. As the aim of Bounty is attracting real users to the project Swap.Online, first of all we are interested in Bounty hunters who participate with real accs, that have got real subscribers who post real content time from time, except information about our or other Bounty. The remuneration in the number of 5k tokens is for them (for real accs). Unfortunately, we can not pay tokens to fake and real accs equally. So, at this week we will pay to fake, only bounty oriented accs, 10 times less tokens. The same action is planned for further weeks. Real acc gets 10x tokens compared to fake one. We remind you, that we are always open to bounty hunters, who do creative tasks. You can contact us directly and offer to complete creative task. It may be video review of our system, translation of articles, any interactive actions in socials. Contact us and we will discuss your reward in SWAP tokens.